A Li woman pauses in her weaving to greet a tourist. The Li are renowned for their weaving skills and rich brocade wall hangings. Visitors can witness some of the traditional ways of life at the Areca Valley Aboriginal Culture Spot, 28 km from the city of Sanya on Hainan Island. "Don’t sit down!” Emma, my Chinese guide, clutched my arm and pulled me away just as the seat of my khakis brushed a rock stool flanked by two stone frogs. Yikes! Up until now, my trip to China’s tropical island had entailed nothing more culturally mind-expanding than a warm jade-stone massage. 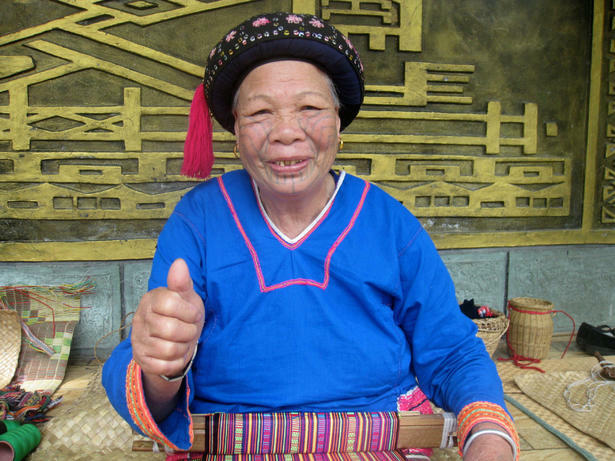 This tour of the Areca Valley Aboriginal Culture Spot (Binlang Valley or Binlanggu), however, where adjacent Li and Miao villages sit crouched among the betel palms, was proving to be an eye-opening experience, filled with bizarre instructions. For example, before entering the Miao village, you’re supposed to shout “hoha, hoha, hoha,” or — the theory goes — you’ll be shot. But don’t say “haho” or you’ll be challenging them. And be forewarned: there may be some ear pulling and hip bumping by the elaborately costumed Miao, a mountain people known for their silver ornamentation and potent herbal remedies. It’s fun, it’s touristy, more of a cultural theme park than a serious anthropological tour, but it does provide a glimpse into the Hainan Island that was. Hainan was a mysterious place. Today, resort-style modernity has swept the image of remote isolation into the South China Sea. But, for centuries, this Belgium-sized island at China’s southern tip was considered the Tail of the Dragon, a place of barbarous tribes and home to exiles such as the famous 11th-century poet Su Shi. The Li were the original inhabitants and their existence on the island can be traced back to the Stone Age. Although many of their ancient customs have died out, and expensive condos and upscale hotels have altered the face of the island, traces of the old ways remain. As I shuffled through the village, I saw an elderly Li woman. She was weaving and her face was lined with tattoos. Motioning with my camera, I asked if I could take her picture. Her fingers stopped fluttering and she gave me a big thumb’s up, a striking image of both tradition and change. Carol Perehudoff is a freelancer based in Toronto. Her trip was subsidized by Cathay Pacific and InterContinental Sanya Resort. Visit her blog at wanderingcarol.com. The InterContinental has a wide range of options, from the perched-over-the-water Sea Pavilion to a Bavarian-style pub. The Nanshan Culture Tourism Zone offers a vegetarian buffet with local herbs and produce for $11. Expect crowds and a carnival atmosphere at most tourist sights. In addition to Areca Valley ($27) visit the Nanshan Culture Tourism Zone ($24) for the sight of the 108-metre-high bronze statue of Kwan-yin, a female Bodhisattva that rises from the sea like a Buddhist Statue of Liberty. Ask your hotel concierge to arrange taxis or tours.